The White Sox acquired 33-year-old Boston Red Sox third baseman Kevin Youkilis in a trade on Sunday. Anthony Rizzo at Cubs spring training in 2012. One aging player and one youngster are making headlines for Chicago’s two baseball teams. The much talked about arrival of the Cubs’ top minor league prospect, 22-year-old Anthony Rizzo, has finally happened. He made his debut against the New York Mets at Wrigley Field Tuesday night. Rizzo collected two hits; his second scored the game-winning run in the 5-3 victory over the the Mets. Meanwhile, the White Sox acquired 33-year-old Boston Red Sox third baseman Kevin Youkilis in a trade on Sunday, to help a team desperate for production at that position. Youkilis was inserted right away Monday in the Sox losing effort against Minnesota. How many players have their trade mentioned by the president of the United States? President Obama thanked Boston for giving Kevin Youkilis to his White Sox at a campaign fundraiser Monday night — he was promptly booed. You don’t tweak the noses of Red Sox fans — they live and die for their team. Kevin Youkilis was pretty much discarded from Boston but his availability was a good grab by the White Sox. The often injured player was not getting along with new manager Bobby Valentine and the Red Sox were able to supplant Youkilis with phenom Will Middlebrooks at third base. The White Sox lost Opening Day starting third baseman Brent Morel to a back injury; he was not playing well at the time, probably because of the injury. Sox General Manager Ken Williams picked up released veteran Orlando Hudson. It was very difficult for the Gold Glove second baseman to make the switch to third — at age 37. Admittedly, Hudson was having trouble with the speed of the ball off players’ bats. He also was not very productive at the plate. There is little doubt that Youkilis is at the down side of his career. Presently he is hitting only .233 and has appeared in just over 40 games. He has been in three All-Star games the past four years and won a World Series ring with the Red Sox in 2007. The White Sox are hoping a change in scenery will boost some production from the former Boston-fan favorite. As to the cost of Youkilis, the Red Sox are picking up most of his $13 million salary; the White Sox sent pitcher Zach Stewart and utility player Brent Lillibridge to Boston. Why did the Cubs wait until now to get Rizzo and what is his impact? By bringing him up to the majors after the weekend the team got past an important deadline: arbitration eligibility. Now the Cubs have an extra year to keep the accomplished hitter under contract. With the Cubs going nowhere fast (they have the worst record in baseball), the fans feel hopeless and the team needs a boost. Rizzo was batting .342 with the Iowa Cubs and there really wasn’t anything else he needed to accomplish in the minor leagues. Before his Cub debut he met the media and told us,"I am here to stay, I am going to work hard every day and learn to get better." Also, Rizzo is one important ingredient to what Cubs President Theo Epstein calls the “Cubs way.” He is a patient hitter with a high on-base average and slugging percentage. This elevation to the major leagues also gives manager Dale Sveum and his staff a chance to have an impact player. 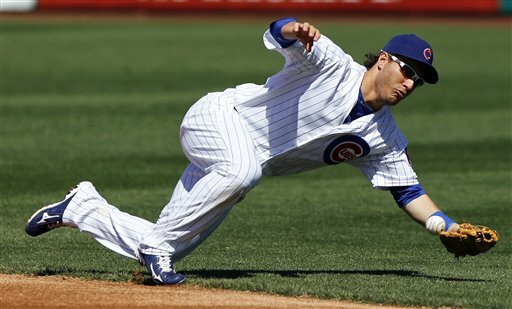 Rizzo will play first base and Bryan LaHair moves to right field, where he experimented during the Cubs-Sox series. David DeJesus will move to center field. How much does the Cubs brass love Rizzo? When Cubs General Manager Jed Hoyer moved from the Red Sox to become General Manager of San Diego he snatched the first baseman in a deal for Adrian Gonzalez. One of the first trades Hoyer made when he moved into the Cubs front office was acquiring Rizzo again for Cubs pitcher Andrew Cashner. Now Cubs fans get to see why management has had faith with the young player. "He is going to have his ups and downs, he will make adjustments," said Hoyer "I love that people are excited — it gives them hope." The White Sox hope this grinding-type player will help them gain some momentum in the AL Central race. It’s been a struggle the past few weeks. The Cubs are hoping Anthony Rizzo shoulders can withstand the hope and bright future of their franchise.